Press Release: IWC Tribute to Pallweber and the Portugieser Constant-Force Tourbillon Edition "150 Years"
Sometimes, it is good to take life less seriously. Someone once said that life is too short to take it too seriously. Not everyone would agree with this, although we would like to think that the majority of us would jump at that opportunity to take a step back sometimes. But alas, it is often easier said than done. Well, there are definitely some fortunate ones who are able to afford to do so. And of course, there are the rest who try to take life less seriously sometimes. Although most of us will be limited as to how much we can play to that, there might perhaps be ways to reconcile this. It can probably be done by our fashion sense, lifestyle choices, or even making conscientious effort in adjusting our goals and expectations. However, we digress. Moving back to horology, we think that watches can be a good representation of our personalities. For someone who is more playful and fun-loving, there are many watches out there that can complement those traits or personalities. Well, what are some of the options that are available in the market? Let’s find out! The Romain Jerome Donkey Kong – a throwback to our childhood. We begin the article by taking a trip down memory lane, to the video games that we played when we were younger. The likes of Donkey Kong, Super Mario, and Pokemon. Are you excited already? In recent years, Romain Jerome – a watch manufacturer from Geneva – decided to toy with our senses by creating watches with themes that reminds us of our childhood. Dubbed the Generational Icons, the watches derived their designs with iconic games that we used to play. This includes the likes of Donkey Kong, Tetris, and the Space Invaders. 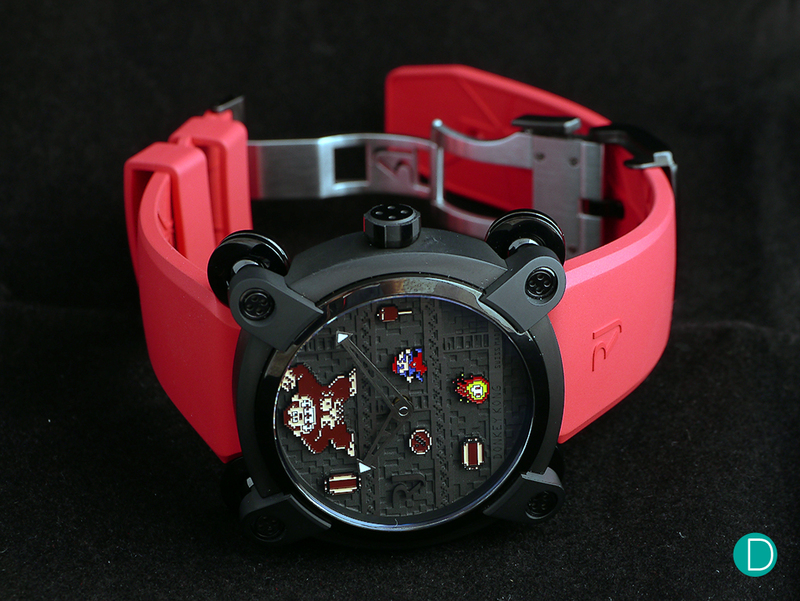 The end result is pretty intriguing, especially when the pixelated game-inspired dials are paired with the brand’s PVD-coated titanium Moon Invader case. The movement is based on the Valjoux 7750, with its chronograph and date functions stripped off. The self-winding movement beats at 28,800vph, and it has a decent power reserve of 42 hours. The Romain Jerome Donkey Kong is limited to a production of 81 pieces, and it is priced at S$24,800 each. While it may be slightly pricey, but it is definitely appealing for collectors who grew up playing these video games when they were younger. The latest piece from Hautlence is a beautiful childhood game transpose in a wrist piece. For those who use Instagram, wrist game is perhaps a term that might be familiar. 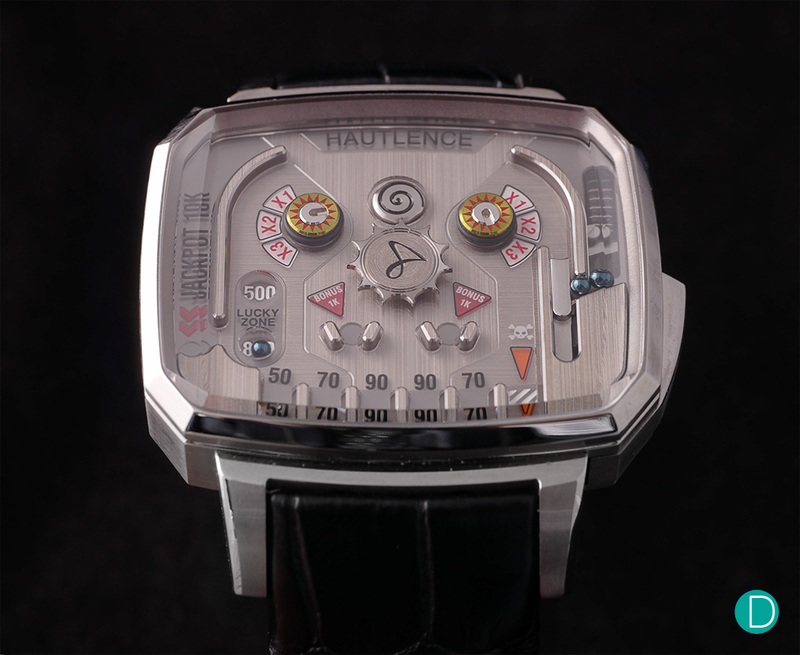 However, Hautlence takes this term to a whole new level, by creating a timepiece that allows the owner to play games. Literally. The concept is actually not that new actually. Hautlence first launched the Labyrinth in 2016, which was based on an out-dated board game that requires the player to navigate a ball around a maze. This year, they went a step further, by creating a wrist device that features a miniature pinball machine. The watch is simply called the Pinball. Unlike the Labyrinth, the Pinball is much more complicated to produce, since there are more mechanical components involved. It is a rather intriguing piece, especially after one gets the chance to toy with this piece. Priced at CHF 30,000 (approximately S$40,855), this is definitely an expensive toy. But for someone who is looking for something novel and unusual, then perhaps the Hautlence might be a breath of fresh air. It will only be limited to a production of 18 pieces. Oh, and for the fun of it, the Labryinth does not tell the time, nor does it have a watch movement. It is purely a game on the wrist. The Bell & Ross BR03-94 RS17. A rather handsome and sporty timepiece. Whenever Bell & Ross was mentioned, the idea of a flight instrument related timepiece would always come to mind. After all, the iconic Aviation collection is the one that brought the brand to fame. But in recent years, Bell & Ross had introduced some interesting pieces as well. Cue the new BR03-94 RS17. The BR03-94 is part of a trilogy that was produced to celebrate the inaugural sponsorship with Renault Sports F1 Team. The timepiece – with its contrasting colours – was inspired by the steering wheels of the RS17 F1 car. We must say that the combination works really well, especially with the carbon fibre dial and a special ceramic composite case. The 42mm BR03-94 RS17 is certainly an interesting sight to behold, especially with the use of its signature Bauhaus-inspired “circle within a square” case design. The watch is fitted with the BR-CAL301 movement, based on the ETA2894-2. The self-winding movement comes with a chronograph and date function, and it boasts a power reserve of around 40 hours. This piece is priced at S$9,000, and it will be limited to a production of 500 pieces. The Hublot Big Bang Sang Bleu. It is a very unusual but cool-looking timepiece. Cool is probably an understatement to describe the new Hublot Big Bang Sang Bleu. The timepiece, which was a collaboration with the Sang Bleu tattoo studio, is definitely unlike anything that you have seen so far. Inspired by Leonardo da Vinci’s Vitruvian Man, the Sang Bleu aims to marry harmony and proportions into the watch’s design. We particularly like how Hublot and Sang Bleu playes with geometric shapes. For instance, the bezel features a hexagon, while the dials and hands features three octagonal-shaped discs. The end result is pretty darn cool. In fact, we were quite impressed by how the design turned out. The interpretation is certainly unique, but each design element really blends and complements one another beautifully. Powered by Hublot’s Unico HUB1213 movement, the self-winding timepiece boasts an impressive power reserve of around 72 hours. The winding rotor also features a triangle with the Sang Bleu emblem, which adds a nice touch to the watch. The watch is available with a price tag of US$18,800 (approximately S$25,420), and it is a limited release with only 200 pieces available. If one is looking for a conversational piece, then perhaps the Sang Bleu is worth a double-take. A cool watch, which is definitely hot! 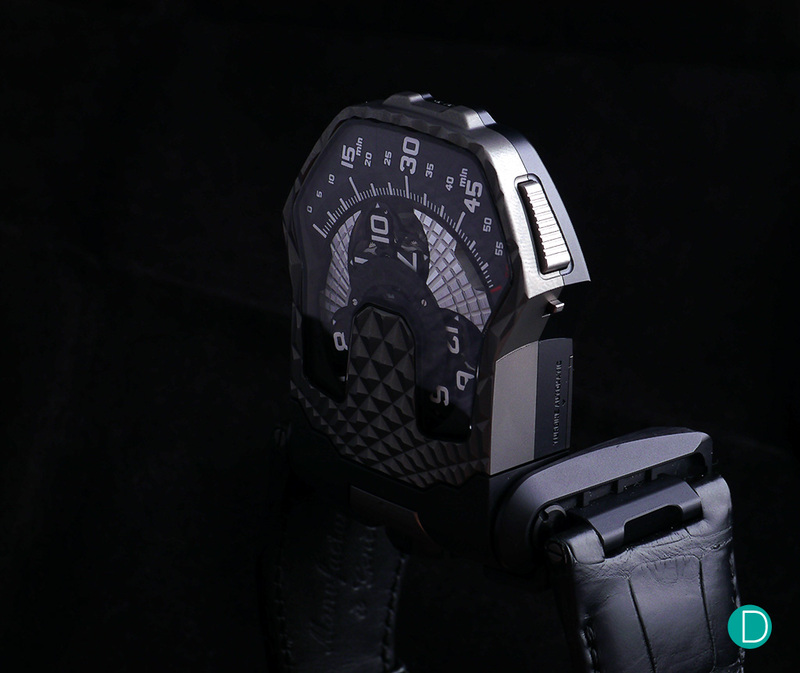 Just when you thought that an Urwerk could not get any more interesting, the Geneva-based watchmaker had proved us wrong with one of their latest novelties: the UR-T8. Produced to celebrate their 20th anniversary, the UR-T8 is given a reversible case mechanism. The user is able to flip the case by first pressing a button at the side of the case, before the turning the case to caseback side. 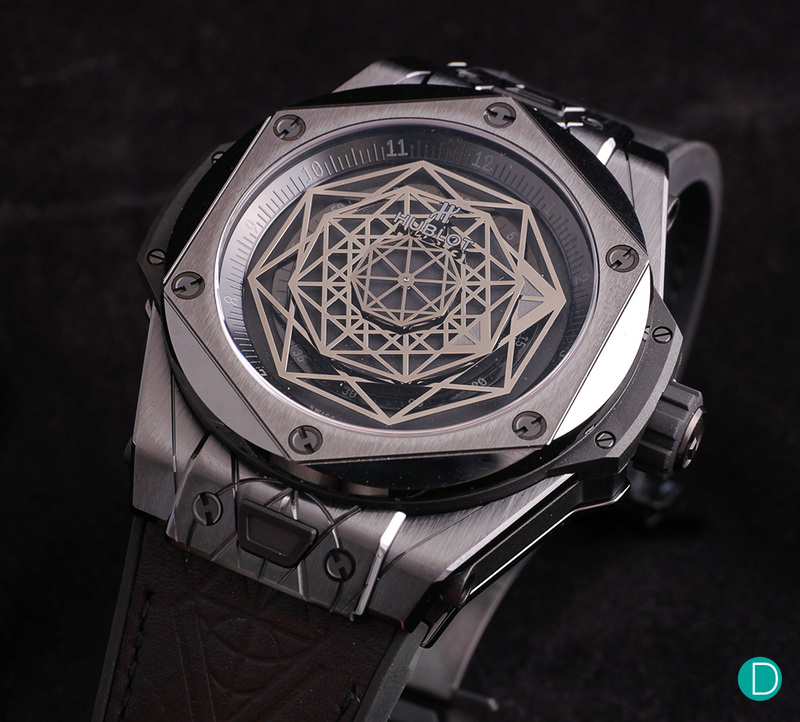 The reverse side is shaped like a titanium shield, with a diamond-cut motif. Coupled with either the titanium or Black PVD case, the timepiece certainly exudes an air of mysteriousness. Besides the new reversible case, the UR-T8 is still an Urwerk through and through. The usual elements include the bull-head type large crown, and the signature satellite complication with rotating hours modules mounted on planetary gears. 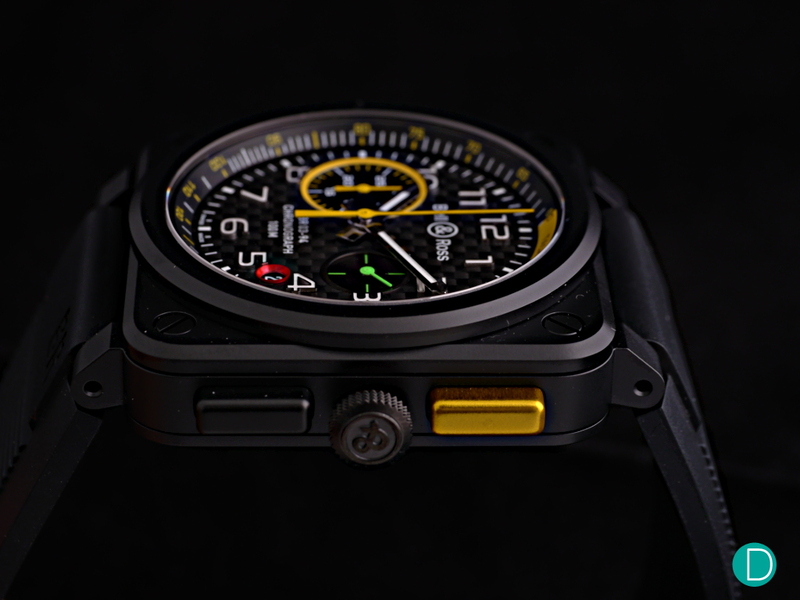 The UR-T8 is available in an initial series of 60 watches in natural titanium or with a black PVD coating, with a retail price of S$176,800. 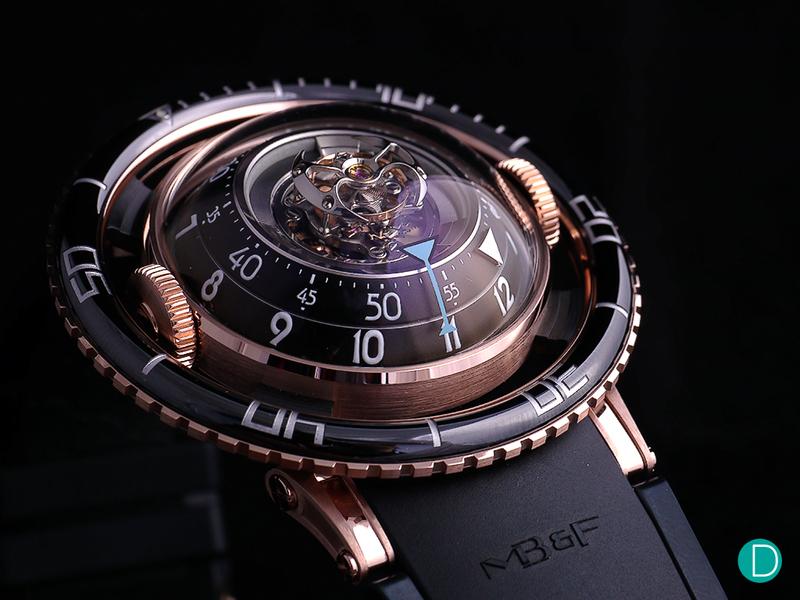 The MB&F HM7 Aquapod. An interesting take on dive watches. Finally, we round up the article with an undeniably cool watch from the sultans of watchmaking creativity. Here is the Horological Machine 7 Aquapod, from MB&F. The Horological Machine (HM) collection is an interesting one. When MB&F launched the HM1 back in 2007, it certainly took us by surprise with its contemporary and unique approach to watch design and aesthetics. Over the years, MB&F produced many more Horological Machines, and each of them had never cease to amaze us. The HM7 Aquapod is no exception. We like how MB&F have reinterpreted the concept and design of dive watches, with inspirations derived from jellyfishes. The final product is pretty organic-looking, although the different elements (especially the domed sapphire crystal and articulated lugs) makes it rather futuristic as well. The centrepiece of the HM7 is perhaps the tourbillon, which is situated at the middle of the watch. It is designed completely in-house, featuring 303 components. Interestingly, the movement is constructed vertically, with all its mechanism rotating concentrically around the centre. Notably, the HM7 comes in two different variants: titanium and rose gold. They are priced at S$160,500 and S$193,500 respectively. It is noteworthy to point out that this is the least expensive tourbillon that MB&F had produced, although it is probably still out of reach for most of us. Nonetheless, this is still a very cool timepiece, and we reckon it will be an icon in time to come. Collectors today are certainly spoilt for choice, unlike a few decades back. Watch manufacturers are now more adventurous, and that can be seen from the novelties that we have over the last few years. It is also noteworthy to point out that many independent watchmakers, such as Urwerk and MB&F, are only around for the last two decades or so. That, together with changing consumer demands and preferences, had proliferated the amount of contemporary timepieces that are available today. If we simply compare to the selections 30 years back, the difference would have been rather stark. We have noted that today’s selections are priced slightly on the higher side. Most of them comes with a five or six-digit price tag, with the exception of the Bell & Ross BR03-94 RS17. It is not a coincidence, actually. These watches cater to a rather niche market, where the clients are willing and able to spend a lot of money on such items. They want exclusivity and uniqueness, which is probably why most of the watches in today’s article are limited edition pieces as well. However, we have to point out that this is not entirely representative of this genre. There are also affordable watches that can be fun and unusual as well, although they are less common. We shall save that for another occasion. So, what are your thoughts on our selection today? What are some of the pieces that should have made it to the list today? Let us know in the comments section below!